In 1766 the Royal Society of London put forward a proposal to journey South. The journey’s purpose was to map the transit of Venus, a step in determining the size of the known solar system – particularly the distance from the Earth to the Sun – and important in navigating the Pacific. It was also to discover Terra Australis Incognita. The Royal Navy, keen to discover the southern lands before its European competitors, provided the ship and crew. King George III, interested in exploration, granted the Society the sum of £4,000. 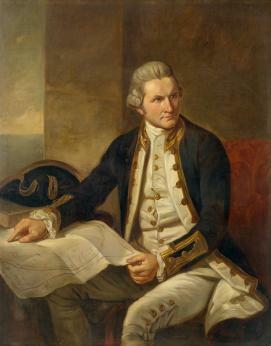 James Cook, who had gained a solid reputation for surveying, navigation and the preparation of charts, was selected to lead the expedition. Cook’s party included John Gore, experienced sailor, two astronomers – including Charles Green, Assistant Astronomer Royal – and two naturalists, Sir Joseph Banks and Dr Daniel Solander of the newly established British Museum. The Endeavour’s journey was a mission to test the latest scientific theories and the ship was in part a floating laboratory. Dampier had charted the west coast, but it was Cook, in April 1770, who became the first European to see the east coast of the new continent. He claimed the land for George III of England and named it New South Wales. Although the east coast was not as barren as the west, Cook agreed with Dampier that there was little to be gained in terms of goods to trade. For scientists, the area was a land of scientific and natural marvels. They found so many new species in one of the bays in which they anchored, that Cook gave it the name of Botanist Harbour, later changed to Botany Bay. They mapped the east coast up to the Barrier Reef. By August they had reached the north- eastern tip of Australia, which Cook named Cape York, claiming the whole of Eastern Australia for the Crown. Joseph Banks returned to England with 17,000 new plant specimens for his botanical collection, and was later to be a strong promoter of the location of Botany Bay as a site for a penal colony. The resolution to found a convict settlement in New Holland was first announced in the British papers in 1786, and the first of 750 convicts started to be loaded on to the ships at Portsmouth by the end of the year. 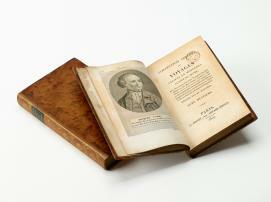 The record of Cook’s voyages was to become popular reading. Louis XVI ordered it translated into French and it was said to be this that Marie-Antoinette was reading in the cells prior to her execution. Read this extract from Captain Cook’s journal and in your own words describe the different values held by Indigenous people and the Europeans. What other kinds of information does Cook’s journal contain? Imagine you are on a voyage to newly discovered land. Write a journal describing the land: the geography, flora and fauna, and the local inhabitants and their language. Include maps, illustrations and diagrams. Be a naturalist (a scientist who studies nature). Choose a plant specimen from your garden and draw it as accurately as you can. Naturalists use a system for naming and classifying living things called the Linnaean system, after Carl Linnaeus who invented it in 1735. Give your plant specimen a scientific name. If you can, find out its ‘real’ scientific name.